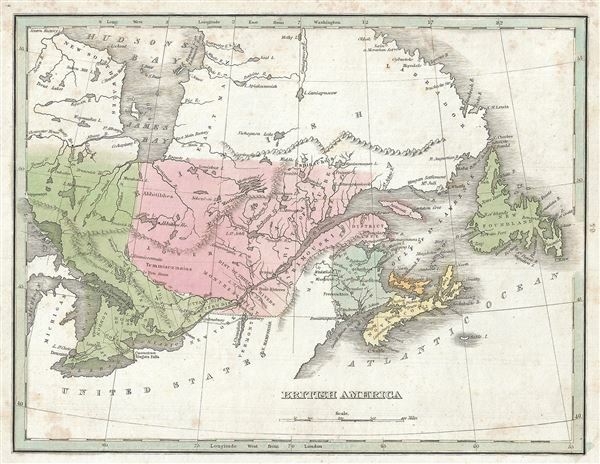 This is a fine 1835 map of Canada or British America by the important American mapmaker T. G. Bradford. It covers Upper Canada (Ontario), Lower Canada (Quebec), Nova Scotia, New Brunswick and Newfoundland and Prince Edwards Island. It also shows the five Great Lakes: Ontario, Erie, Huron and parts of Lake Michigan and Lake Superior. Niagara Falls is noted. Also identifies Three Rivers or 'Les Trois Rivieres,' a primarily French administrative region in Quebec established in the 18th century. The native tribes 'Abbitibbes,' 'Temmiscamains,' 'Papinachois' and the 'Mistissinnys' are mentioned. Towns, rivers, mountains and various other important topographical details are noted. Elevation throughout is rendered by hachure and political and regional territories are color coded. According to the earliest written accounts, the Russians were the first Europeans who reached Alaska and eventually became permanent settlers. The modern Canadian provinces and territories were under British and French control from the 16th century, until France gave up its claims in the Treaty of Paris in 1763. This map was drawn just prior to the Canadian Rebellions of 1837 against the British Empire that would eventually lead to the United Province of Canada and the adoption of representative government by 1848. Canada remained a collection of British colonies until its confederation in 1867, when the British colonies of Ontario, Quebec, New Brunswick and Nova Scotia united as Canadian provinces. Although known as the 'Birthplace of Confederation,' Prince Edward Island would only join the confederation in 1873. This map was published as plate no. 64 in Thomas G. Bradford's 1835 Comprehensive Atlas Geographical, Historical and Commercial. Bradford's atlas, published in 1835 was an important work on many levels. First, it was one of the first American atlases to follow an encyclopedic format, offering readers extensive geographical and statistical tables to supplement the maps themselves. Second, it was published in Boston and influenced the city's rise as a publishing center later in the 19th century (at the time most publishing in the United States was restricted to New York and Philadelphia). Third, this atlas was the first to contain a separate and specific map showing the Republic of Texas. Fourth and finally, Bradford's atlas in some instances broke the Euro-centric mold regarding atlas production. Among other things, Bradford focused his atlas on the Americas and abandoned the classical decoration common in European atlases in favor of a more informational and inherently American approach.